Viber is a convenient SNS application and it owns increasing users for recent years. For iPhone users who use Viber a lot, the Viber data may include lots of important information. And of course, losing Viber messages, such as mistaken deletion or viral attack, will cause huge trouble for users. 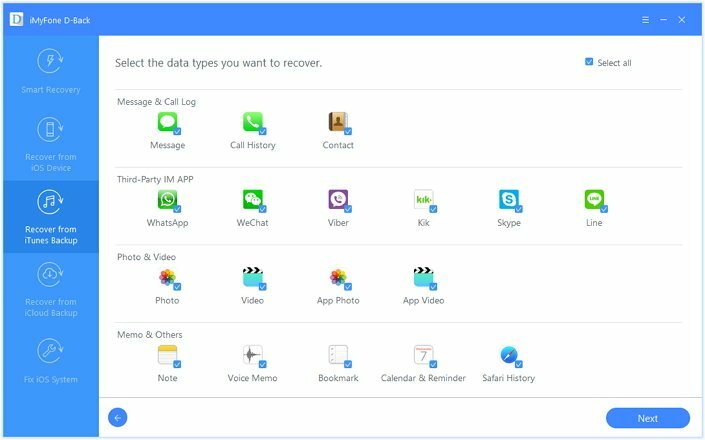 To solve iPhone Viber user’s data loss problem, here the article offers three ways on how to recover Viber messages on iPhone. Mostly, the data loss on iPhone is sudden and users may don’t have any preparation for it. But even without any backup, Viber messages can be recovered from iPhone directly. 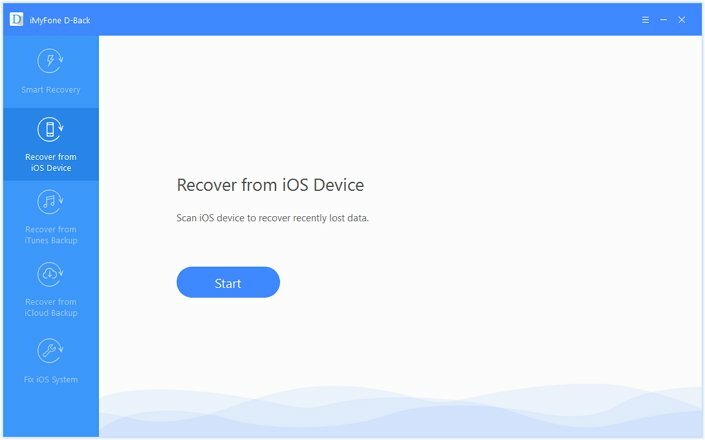 What you need is just one excellent iPhone data recovery tool, such as iMyFone D-Back iOS Data Recovery (Windows version) and iMyFone D-Back iOS Data Recovery (Mac version). With powerful features, this tool is your top choice to recover Viber messages without backup. Recover Viber messages lost in different situations. Preview Viber messages to recover what you need. Support almost all iOS devices running kinds of iOS versions, even iPhone 7 and iOS 11. 20+ types of iPhone file such as WhatsApp, WeChat, Kik can be recovered. Simple procedures allow users operate it easily. Run iMyFone D-Back and choose "Recover from iOS Device". Then click "Start". Check the data type "Viber" and then click "Next". 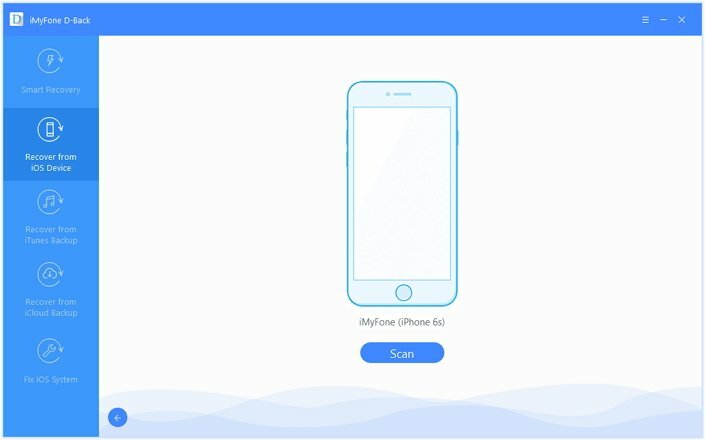 Then you can connect your iPhone to the computer and click "Scan" to proceed. After scanning, this tool will list all the Viber messages, including the lost for your preview. You can preview all or only preview the deleted data by choosing "Show only deleted ones". Check what you want to recover. Then click "Recover" to choose one folder and store your recovered Viber messages. In this way, your lost Viber messages are back. If you have the habit to back up your iPhone Viber messages regularly, you can easily get them from your backups. See how to recover deleted Viber messages from iTunes backup/iCloud backup/Email. 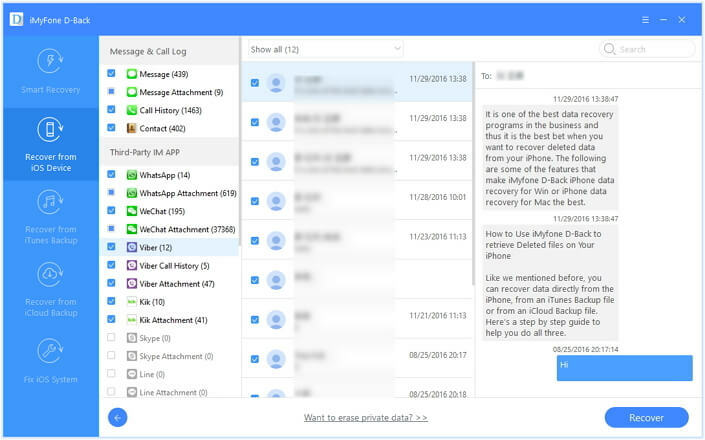 As the most recommended methods to recover lost iOS data by Apple, restoring iTunes/iCloud backup onto your iPhone to get back lost Viber messages has been tried by lots of iPhone users. It is free and have the specific instructions from Apple. You can just refer to the link to restore Viber messages. 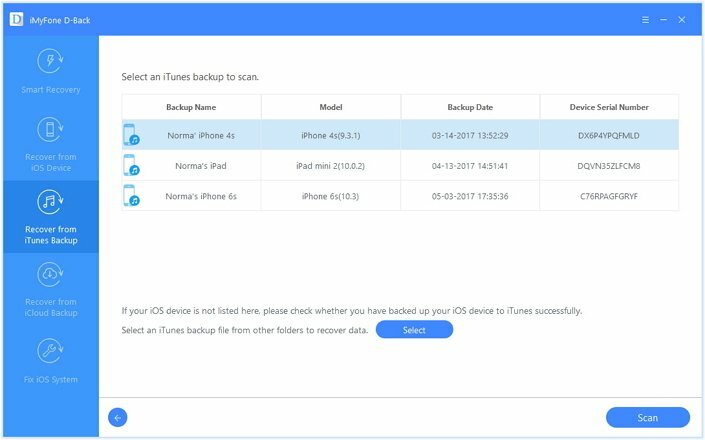 However, you should note that if you restore the iTunes/iCloud backup, all the existing data on your iPhone will be replaced by the data in backup. If you don’t want to restore your backup, iMyFone D-Back can help you gain access to an iTunes or iCloud backup and extract the missing Viber messages. Here’s how to do it. Step 1: From the main menu, select “Recover from iTunes Backup” tab and click “Start”. Select “Viber” in the next window and then click “Next” to continue. 3: Once the scan is complete, select the Viber messages you need and click “Recover” to save them on your computer. 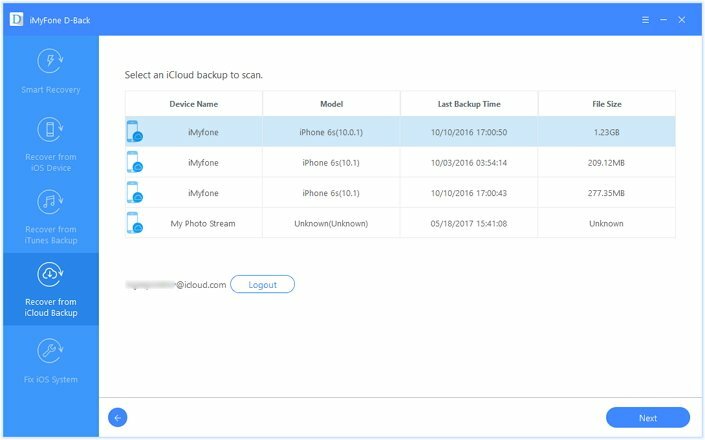 Step 2: Log in to your iCloud account and then select the iCloud backup file that may contain the missing Viber messages. Click “Next” to download and scan the backup file. Step 3: Once the scan is complete, select the Viber messages you want to get back on the preview window and click “Recover” to save them. If you have sent Viber messages by email according to Viber’s suggestion in the following directory: Viber > More > Settings > Calls and Messages > Email Message History and send Viber Messages to any email account, you can just log in your email to download the attached file. Your messages’ backup is there for your view. However, your photos and videos won’t be backed up to your email. And the Viber messages are stored in CSV files and cannot be restored to iPhone. 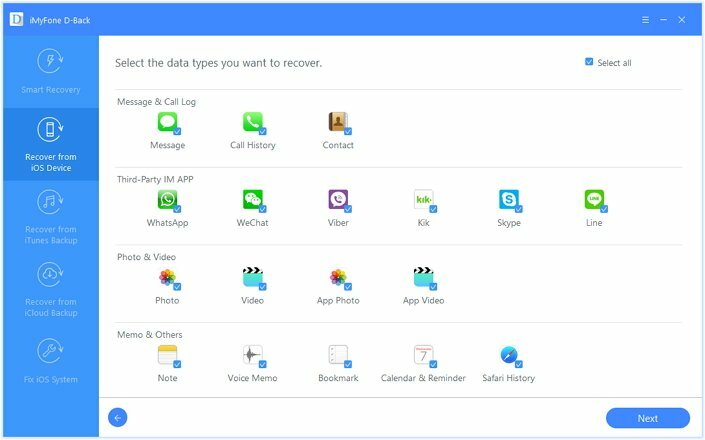 Now you get methods to recover deleted Viber messages on iPhone. Most of these methods are free, even iMyFone D-Back and iMyFone D-Back for Mac offer the free trial version for users. Just download and have a try!